Beat the cream cheese, sugar, orange juice and orange zest in a medium bowl with a fork or whisk until the mixture is smooth. Fold in the whipped topping. Spoon about 2 tablespoons cream cheese mixture into each pastry shell. 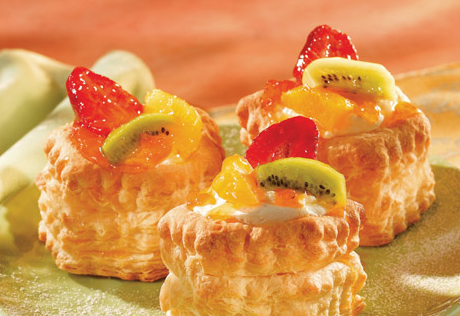 Divide the fruit among the filled pastry shells. Brush the fruit with the preserves. Ingredient Note: To soften the cream cheese, remove the wrapper and place the cream cheese onto a microwavable plate. Microwave on HIGH for 15 seconds or until softened. Make-Ahead: This recipe may be prepared as directed above and refrigerated for up to 4 hours.